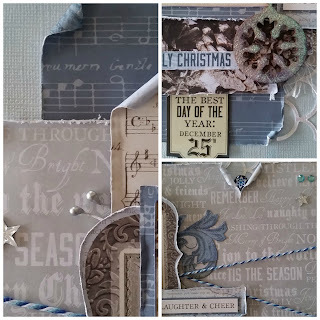 When I saw the Kaisercraft Frosted range - I loved it. I love the blue and grey hues .... and I think of Christmas and snow and and bling and sparkles .... so pretty! I used a plain blue cardstock to start off with. Cut a rectangular strip from the reverse side of the Icicles paper, distressing the edges and curling up the opposite corners - place this down first. 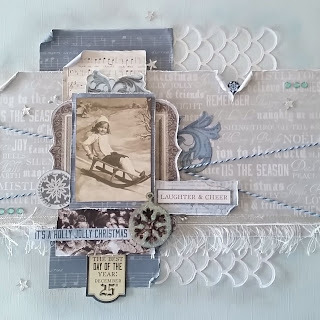 The white cut out - is from a die I borrowed, which I covered in stickles, cut in half and lay this down to line up with the Icicles paper. Then cut about half of the reverse side of the Frozen paper (use the blue), again distressing the edges and layering this on top of the the other Icicle paper. I then cut two smaller pieces - one from the reverse side of the Frozen paper (white bit) and the other from the cones from the Glacial paper - distressed the edges of these too. From the Icy paper, cut out the Grey frame in the top right hand corner, distress and turn it sideways as part of the matt for the photo. The "photo" - matted on the music part of the Icicle paper is taken from the Correspondence paper - so effective, everyone keeps asking me who is that in the photo! One of the flourishes is from the Collectables and the other is cut from the Icicles paper. The balance of the words and embellishments are taken from the sticker sheet and the Collectables. I finished off with a lightly rubbing some darker blue and grey chalk around the papers.